In October 2008, there was an editorial piece in the New York Times titled - Buy American. I Am. Most readers would have ignored the article if they did not notice the author. It was none other than, the world's richest investor, Warren Buffett. It was one of the rare occasions when Buffett was shouting from the rooftop that he is loading up on American stocks. Simply because he believed that America has a great future. Now, I don't want to undermine Buffett's genius in understanding businesses and their intrinsic value. After all, his company Berkshire Hathaway has investments in GEICO, American Express, Coca Cola, Wells Fargo, Southwest Airlines, See's Candies - all great investments. But I'm not writing to you today about his stock picking genius. Rather I want to draw your attention to his unrelenting conviction in the long-term future of American economy. Many investors have produced returns similar to or better than Buffett. But hardly anyone can claim to have done that for more than half a century. That's because of a secret trend that he followed for decades and only on rare occasions did Buffett share it with the world. In fact, Buffett spoke of this trend only once every few decades! This is why most investors did not even bother to pay attention to it. But some investors did pay attention. And they made a ton of wealth. You can too. I will show you how. Take a close look at some irreversible trends in India. You would find the same trends that were seen in the US in the 1970s. I have been studying these for past couple of months. I am convinced that following these trends is the only way to bag stocks that offer a once in a lifetime opportunity. Imagine someone buying the stocks of Titan, Asian Paints, Voltas, and HDFC Bank in early 2000s. Only someone entirely convinced about the future of Indian stock markets, over decades, could have made such bets. But I'm not talking about the past. I'm talking about the future. The good news is that the once in a lifetime opportunity to grab a whole bunch of stocks, with phenomenal upside, is showing up right now. I am talking about some irreversible trends in the way Indians live, earn, save, invest, consume and transact. Remember I told you about more Indian households entering stock markets in 2019, than ever before? Turns out that Prashant Jain, one of the most reputed fund managers of the oldest and largest funds in India, shares a similar view. Even the manner in which India is making a name for itself in space programs, international sports events, medical discoveries, renewable energy, and hi-tech defence are just some of the irreversible trends I have discovered...and trust me when I say that I have discovered many. You too may have noticed such trends around you. Trends that are changing India positively and forever. I would like you to write to me and share such positive trends that you've seen around you. And I will do my best to publish as many of your stories and observations as I can in the 5 Minute Wrapup. As if on cue, while I was writing this piece, I came across some latest data projecting the nominal GDP of countries by the year 2050. The article focused on how China would be by far the strongest economy in another three decades. In fact, its GDP could be more than double of America's. But that India will be a close second. With GDP crossing 40 trillion dollars, the Indian economy will be at least a third bigger than the US. No doubt the 40 trillion dollar GDP will not come without some hiccups. But once you know the stocks that could gain the most in the coming decade, you too be saying - 'Buy Indian. I am'. 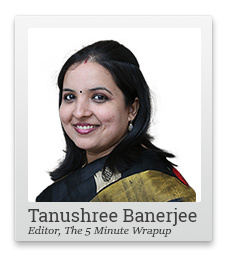 PS: Tanushree Banerjee, editor of StockSelect, is working on a big project. She will announce it to the world very soon. She has identified huge trends in the Indian economy that will create mind-boggling opportunities to profit from stocks. You can get access to these recommendations as a premium subscriber by signing up here. Equitymaster requests your view! Post a comment on "This Trend Will Produce a Once in a Lifetime Opportunity to Buy Stocks". Click here! 1 Responses to "This Trend Will Produce a Once in a Lifetime Opportunity to Buy Stocks"
How did they arrive at $46.3trillion for India?. Even at 10% growth rate either nominal or PPP, it still doesn't add up. Is it a typo?